Tuesday, after breaking camp on the Snake River and touring the Grand Teton Scenic Road, I continued northward, just an hour or so, to the granddaddy of all parks, the world’s first national park…Yellowstone National Park. Unfortunately, this wasn’t the best day to visit such a majestic place. My general mood was wading near the bottom of the barrel of attitude; this was day forty something-or-other of this Great American Road Trip and I was getting a little frazzled from being on this endless road. My sour attitude was exacerbated by the fact that there were two main roads blocked off that day in Yellowstone, which meant if I wanted to see the geyser Old Faithful and other natural sites on the west side of the park I would have to drive one hundred and forty miles out of my way to see them. 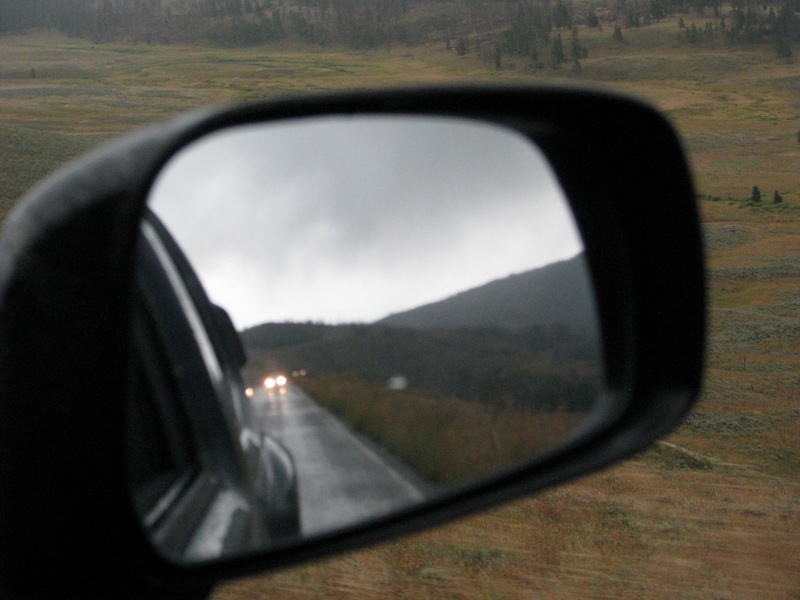 Add to that the continuous rain, cold and clouds…plain and simple — it was just a dreary day in Yellowstone. At some point along the seemingly endless miles of this two-laned road the cars started backing up in a single-file traffic jam; there were no cars coming from the other direction. Everyone in the line-up in front of me U-turned, one after the other, retreating back from where we came. Since there was only the one long road in or out I wondered where they might be going…? I made it to the front of the line to see that a tree had fallen across the entire road. It was a tall, slender tree, wide enough to wrap your arms around it. I wasn’t turning back. A dozen other men felt the same way as we piled out of our vehicles, grappled onto that tree and, in unison and all grunting like wild animals, heaved that tree across the wet pavement. We managed to slide the top of that tree, the flexible part, halfway across the road, opening one lane of travel. That was the best we could do. While the other men were exchanging high fives and congratulating each other on a job well done, I jumped in my SUV and rumbled over the debris field left by the fallen tree, showing everyone that the road was passable while making a timely exit for myself before the north and south traffic began vying for that one lane. That was the first roadblock of the day. The second roadblock came in the form of a mudslide, just south of the north gate, near the hamlet of Gardiner, Montana. Traffic was backed up for miles. Some of the vehicles U-turned, again, making me wonder where they might be going on this long two-laned road that stretched out for hours…? This time there was no helping the situation, no working as a team to remove the obstacle, we had to wait for the road crew to bulldoze the mud off the road. 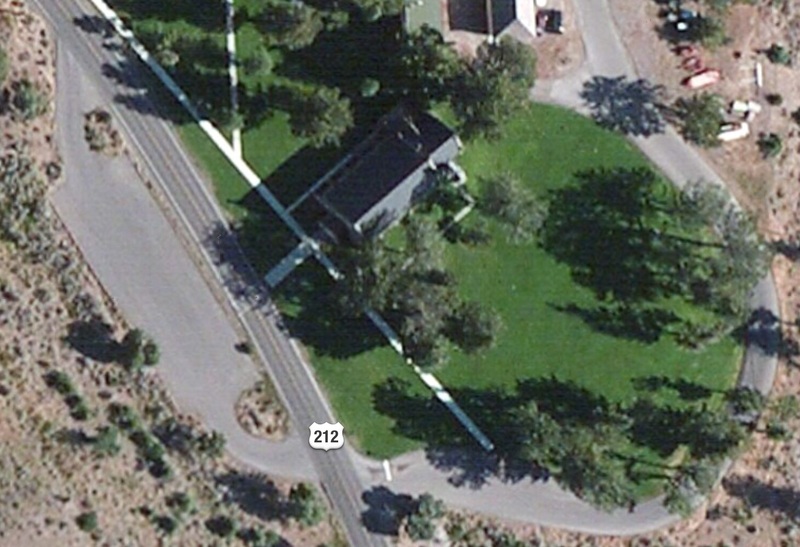 Aerial view of the church with the parking area, green grass and elk. I was just a hundred yards or so from the intersection of Rt.212 & Rt.89, near Mammoth Hot Springs, when I managed my way into a church parking area where others were gathering to wait. We were stuck there for an hour or so but, as luck would have it, there just happened to be a herd of elk grazing on the church lawn across the street. We passed the time photographing the elk while the male elk passed the time meandering from one female to the next, sniffing at their hind quarters, testing the waters to see which female, of the twenty or so, would be suitable to mate with him. It was rutting season and the male elk, the bull, was feeling randy. The bull elk was also very ornery. At one point, traffic started to back up in the road between us and the herd of elk. One blue car stopped in the road to take pictures. The male elk, for whatever instinctive reason, didn’t like this. He scratched at the ground with his hooves, rubbed his full rack of antlers back and forth across the grass, bugled in that shrieking way elks bugle and then charged, head first, into the passenger side door of that blue car! The car shook violently from the impact. The people driving the blue car thought it was funny but, somehow, I don’t think their insurance company will be laughing — there was blue paint on the elk’s antlers. Another car, a white Volkswagen Bug, was also the victim of this bull’s wrath. From our angle we couldn’t see how badly the cars were dented but I would imagine it would be costly and, sorry but, I didn’t get pictures of the attacks because I was too busy scurrying to the very top of my SUV, much like everyone else in the parking area who were running behind cars to avoid being impaled by that big, bad bull! After those two incidents the bull went back to finding a mate. The white VW bug that was rammed. About that time we received word that the mudslide was cleared from the road ahead. 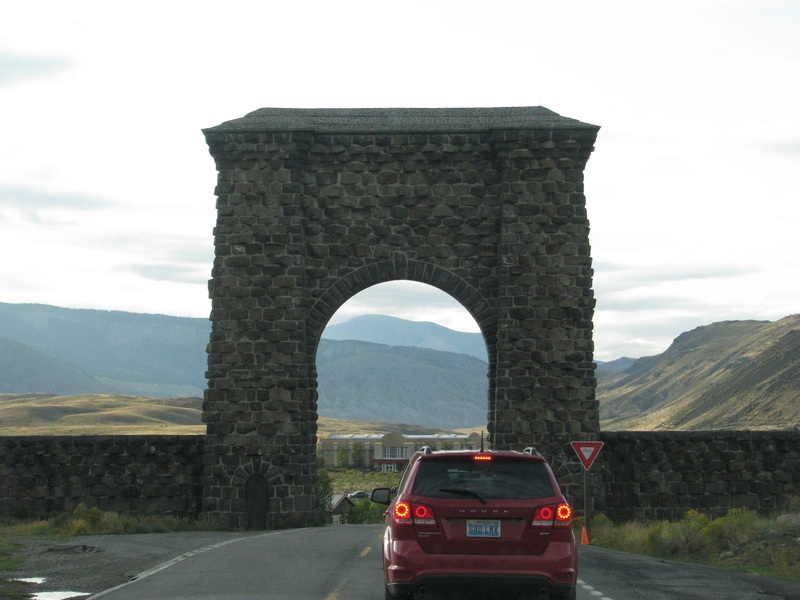 A short time later I was exiting the North Gate of Yellowstone. I hope you forgive your enemies.